Of all the auto makers that sell product in North America, Nissan is one of the most well rounded in terms of product offering. They’ve got product available in almost every segment. Want a sedan? They’ve got three to choose from. Want something on the cheap? They offer the cheapest new car available in Canada. Looking for something funky and unconventional? Nissan will be happy to point you to a Juke. Are you a performance nut? The 370Z has been a gear head favourite for over a decade and the GT-R is respected as much as the Queen. Have a growing family? Nissan has five, yes, five SUV’s/CUV’s waiting to earn your hard earned cash. Actually, with the introduction of the Qashquai, make that six. Perhaps they have so many in this category because they lack a true minivan, though they did make an effort to bring the Quest back a few years ago. The only segment left is the truck segment and they’ve got two. This is an interesting segment because when it comes to trucks, everyone’s go to is the domestic brands. Ford, GM and Ram dominate the segment. The only other manufacturer that sells trucks, Toyota, lags significantly in the segment despite recent model updates. So, it’s no wonder then that Nissan took a very long time in introducing a new Titan. The business case for a new generation obviously wasn’t immediately justifiable. It’s a bit like entering a race that includes the likes of Usain Bolt and Andre de Grasse. You know you aren’t going to win, so why bother? 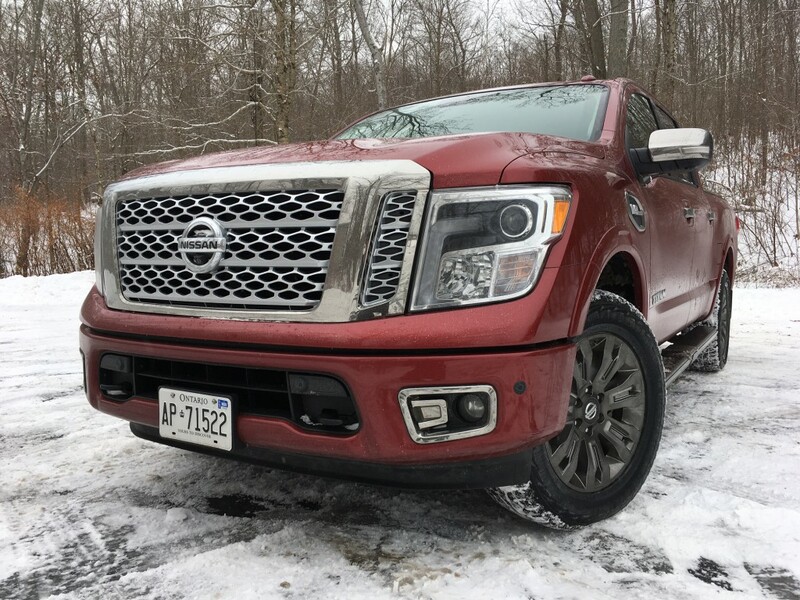 Well, clearly Nissan thinks they’ve got something in the new Titan that will draw die-hard truck guys and gals away from its formidable opponents. Perhaps just as important as a truck’s capabilities is its looks. No one wants to be seen as driving something that doesn’t look the part of being rugged and tough. This must be particularly challenging for designers because there’s only so much you can do with the exterior styling of a truck. The new Titan, in my view, is the most unique looking of them all, despite having heard grumblings that it looks too much like an F-150 (I really don’t see the resemblance). 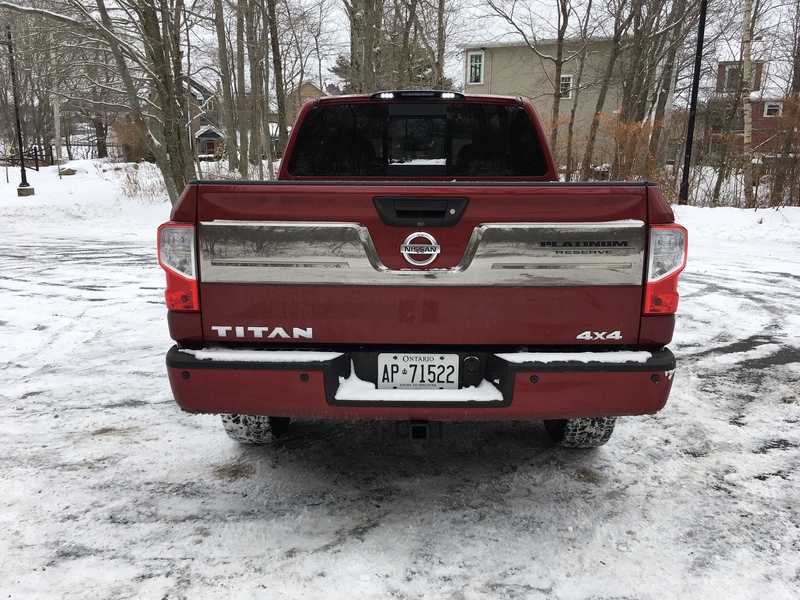 But I like to big Nissan chrome grille with the massive TITAN stamp on top. I love the look of the headlights which feature LED daytime running lights and optional LED headlights. I like the wheel design found on my Platinum Reserve tester as well as the uniquely styled tail lights. It all screams Japanese to me, and specifically, it all screams Nissan. I love that Nissan was able to update the styling without going too “American” with it, because the temptation to do so must have been there. In my mind, this is a good and rugged looking truck that shouldn’t draw the ire of too many domestic truck fans when you inevitably pull up next to one of them at a set of lights. 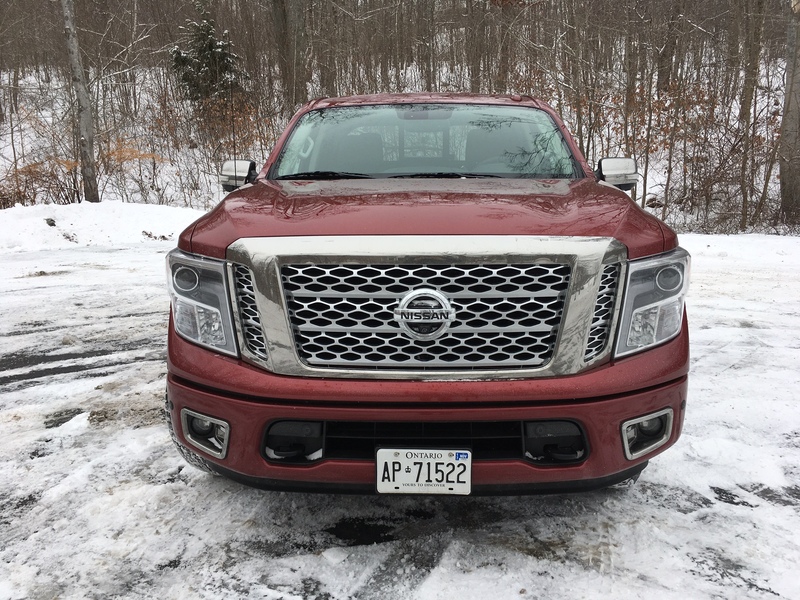 Nissan Canada sent its highest trim for the half-tonne Titan, which is the aforementioned Platinum Reserve, and it certainly feels opulent inside. 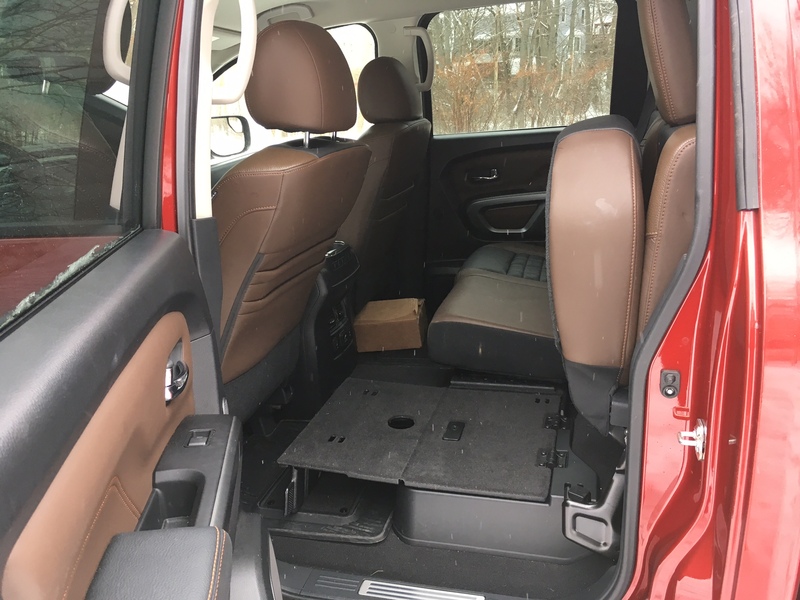 You are immediately greeting to contrasting black and brown leather seats which are both heated and cooled and are completely comfortable place to be. You get a substantive steering wheel with wood trim around the entire circumference (also heated). You get an intuitive touch screen which houses the back-up camera which also features the entirely useful and almost necessary 360 degree aerial camera – perfect for backing up into parking spaces. Though it should be mentioned that while the infotainment unit is innate, it doesn’t always respond to controls on the first try and it is an awful long reach from the driver’s seat (go go gadget arms). Overall, the cabin oozes luxury more than a utilitarian truck-like interior. 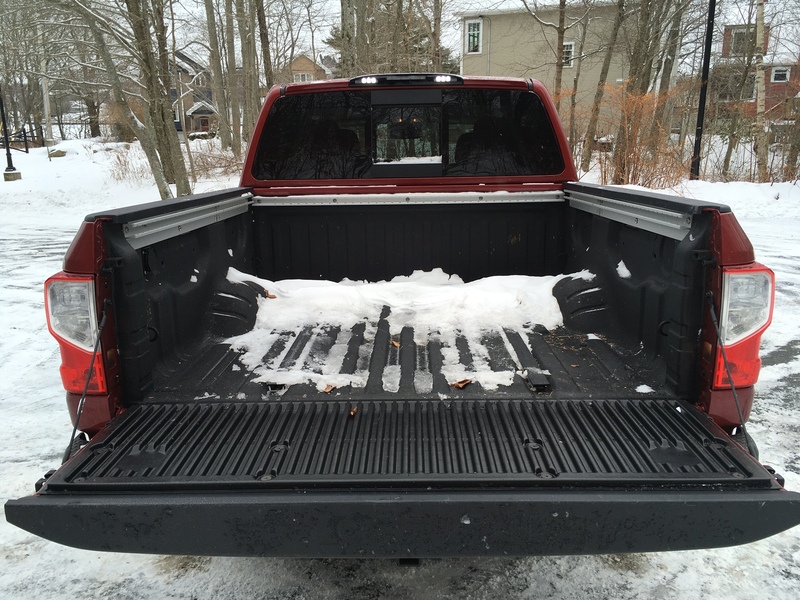 That’s not to say that there aren’t truck-like cues such as the manual dial that changes from 2WD to 4WD or cubby holes en masse or the ludicrously large storage area between the seats. The feeling of luxury continues in the mass seats with a genuinely colossal amount of room for rear seat passengers. The seats also are heated and passengers have their own climate control. The bottom seat cushions also fold upward for more versatility. About the only noticeable omission seems to be the lack of a sunroof. Everything other feature is either expected or an unexpected surprise. You may have heard all about the new Cummins diesel available in the Titan, which is earning lots of praise from the automotive press, but that engine is currently only available on the XD body style, which is much larger than the half-tonne. If you opt for the half-tonne, you can get any engine you want, as long as it’s the 5.6 litre V8. 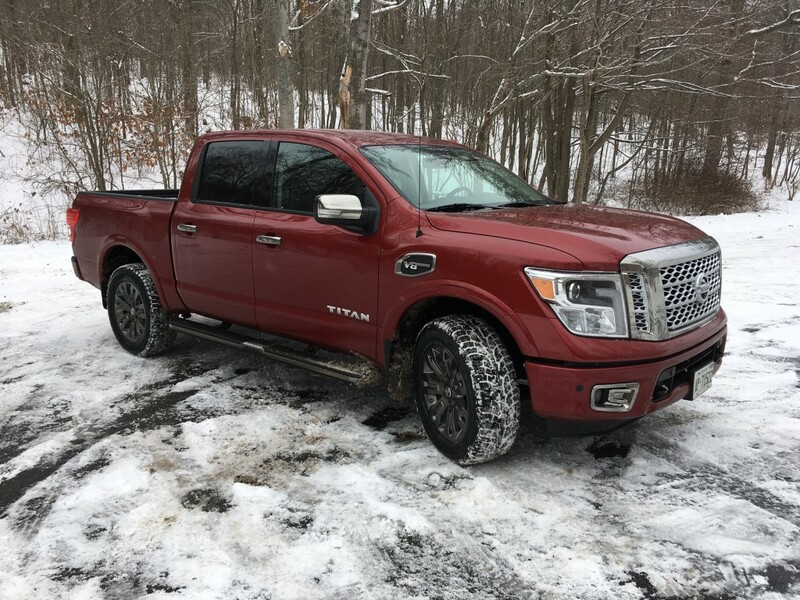 If you somehow remember the old Titan, you’ll note that it also featured a five-six but this version is more powerful as it is good for 390 horsepower and 394 pound feet of torque mated to a seven-speed automatic. This engine, in terms of its performance, is an absolute gem. Not only does it feel smooth without any jerkiness coming from the transmission, but the exhaust note is outstanding. The growl that comes from the exhaust when you hit the push start seems to release endorphins the same way spicy food does. It’s fantastic. Likewise, putting your foot down also unleashes the beast and hustles the nearly 6,000 pound porker off the line with gusto. While the cabin is lavish, the ride quality certainly is not. The suspension bounces over bumps and quick acceleration and braking makes it feel like you’re driving a rocking chair. The steering is significantly weighted, but this causes a bit of an issue in parking lots – not to mention the Titan’s general masse. Again, thank goodness for those camera aids. As evidenced in the pictures, I was able to see how the Titan handled the typically unpredictable Maritime weather which features the usual suspects of freezing temperatures that quickly warm up to 10 degrees creating snow, hail, rain and freezing rain along the way, only to fall back down to -10 by the time night falls. 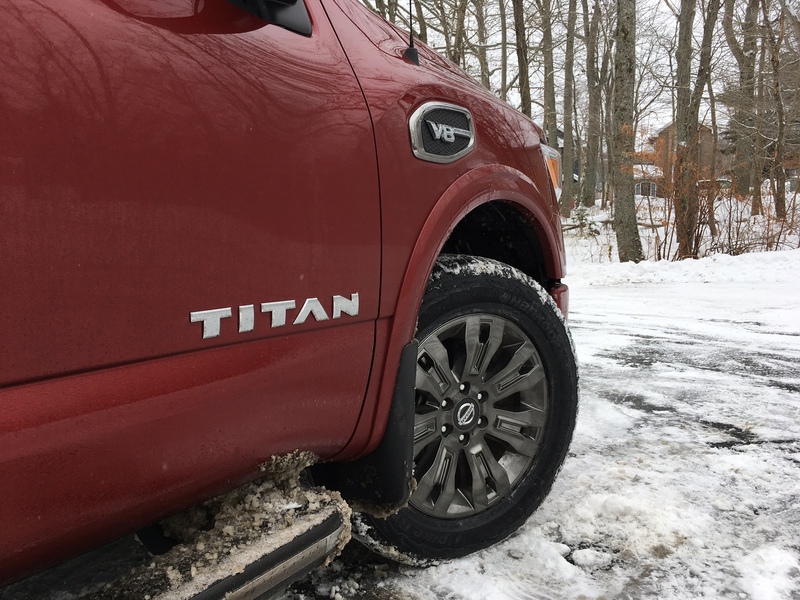 I am pleased to report that, thanks in partial to its winter tires, the Titan was largely unfazed. Though it should be said that if you drove in these conditions in 2WD, the back end was only too happy to get out of sorts. Fun in empty parking lots, embarrassing on public roads. 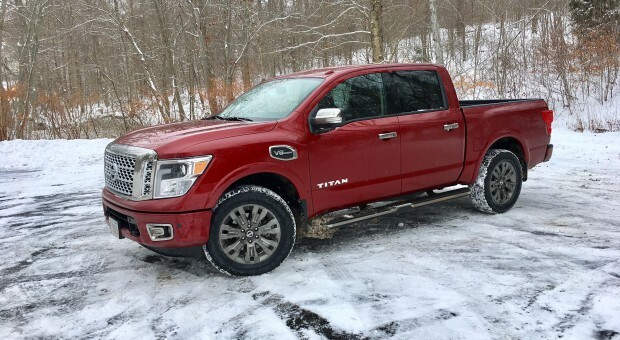 Make no mistake, the Titan is just as capable as its American rivals, but the manner in which it goes about it is not as refined. As you’d expect with a big brawny V8, fuel consumption is not the Titan’s forte. That’s fine, most buyers should know what they’re getting into with eight cylinders. What is completely unexpected is just how thirsty it is. I managed to return 18.8 L/ 100 kms in mixed driving – well off the official numbers of 15.2 L/100 kms city and 11.1 highway. This is particularly disappointing because I was able to return a much more palatable (and impressive) 14. L/100 kms in the GMC Sierra half-tonne with the 5.3 litre V8 a few years ago. That engine featured cylinder de-activation and could run on fours if need be – something the Titan doesn’t have. 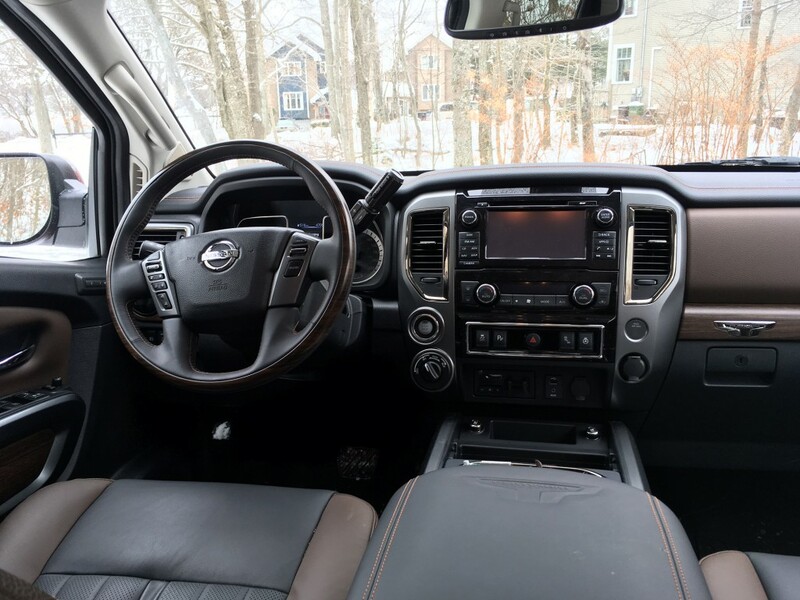 But something Nissan does now have is a credible contender in the lucrative truck segment. The problem is, it’s taken entirely too long to catch up. 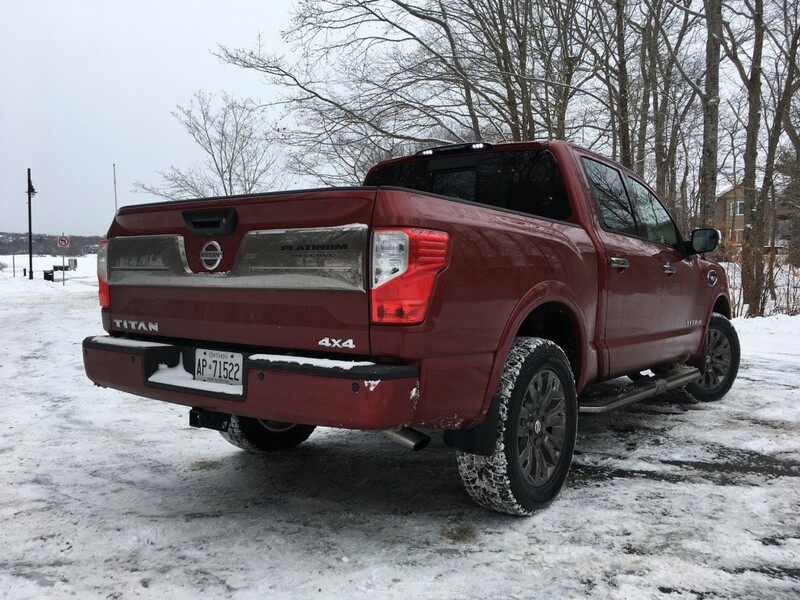 I alluded to Nissan perhaps taking their time in decision whether to update the Titan or axe it all together. That may or may not be true, but regardless, during this time the pick-up truck segment has catapulted forward. 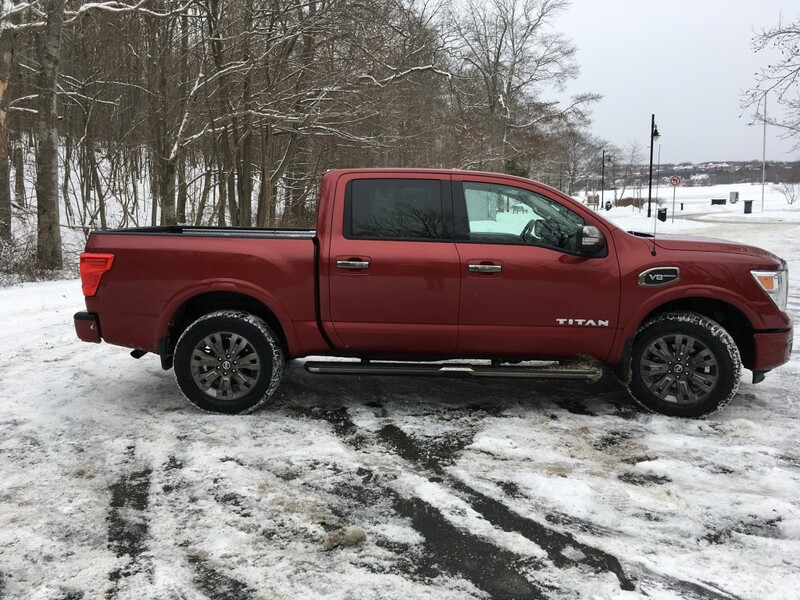 But for now, this new Titan does the trick of both manning the post in Nissan’s well-rounded line up all while creating a splash while doing it. The problem is, a splash doesn’t often faze a king. Oooohh aaaahh that exhaust note!